Go ski Saddleback in Maine (with a new owner, hopeful to re-open for skiing winter 2017-18 season). It’s the way skiing and riding used to be, before high speed lifts, concrete lodges, condos, and super wide trails. 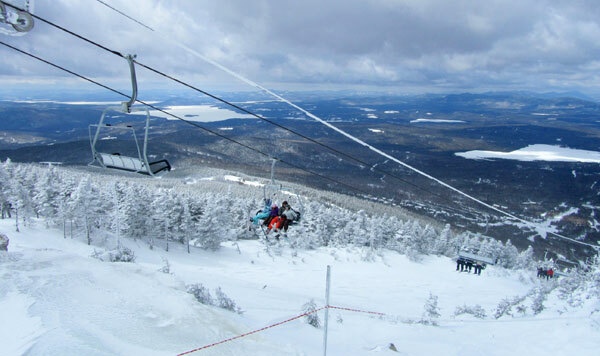 Saddleback is no small mountain, with a summit elevation of 4,120’ and 2,000’ vertical of skiing – its in the big boy league of New England resorts, and certainly Maine’s Sugarloaf and Sunday River. But Saddleback marches to a different beat, all the lifts are fixed grip, there is even a t-bar, some of the best trails are un-groomed glades soaked with natural snow – given the elevation and the lake effect storms. 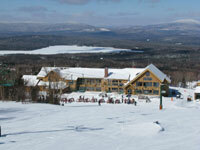 Staying on the shores of Rangeley Lake at Loon Lodge completes the perfect ski getaway picture. First, the skiing: The views from Saddleback are amazing, of Saddleback and Rangeley Lakes, and the white capped mountains beyond. 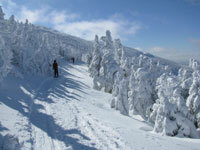 Of Saddlbeack’s 66 trails and glades, there is much variety. The Kennebago Steeps offer exciting black diamond terrain, noted as the largest steep ski section in the East served by its own quad. Especially unique is Casablanca Chutes and the unrivaled Muleskinner trail reached by half-mile traverse past snow ghosts – this is an experience your advanced/expert skiing kids won’t soon forget. Saddleback has beautiful trail skiing – more narrow, bending, and interesting than your typical boulevards at today’s resorts. Saddleback’s less hurried ski pace, given the slow lifts, also means less people on the trails during your descent. How nice to find yourselves on a trail all to yourselves. For beginners, Saddleback’s South Branch area is ideal with four miles of gentle ski terrain, completely segregated from the upper mountain skiing, served by its own lift near the base lodge. Saddleback’s Ski and R ide school has the lowest student to instructor ratio in North America; 3 to 6 year olds receive one on one instruction until they can ski independently. No class at any level has more than 5 students per instructor. You just don’t find that kind of service at most ski resorts. You also don’t find lift tickets at $49 for big mountain skiing like you do at Saddleback ($59 on holidays and Saturdays). Saddleback’s staff and local skiers are super friendly from the lifts to the post and beam lodge with a grand fieldstone fireplace and the lively Swig n’ Smelt bar upstairs that serves a pub menu with sit down lunch (try the Muleskinner burger) and après ski. For lodging in the Saddleback area, stay slopeside in a mountainside condominium or stay on Rangeley Lake at The Loon Lodge, a beautiful 1909 log cabin with great sunsets and a cozy family suite called the T-Bar Christie Suite. The Loon Lodge serves delicious chef prepared meals in their lakeview dining room, or more casual après ski fare in the Pickford Pub during sunset over the frozen Rangeley Lake. So treat your kids to skiing in its essence, and staying in a century old log cabin by the lake (don’t worry, they have wifi too). 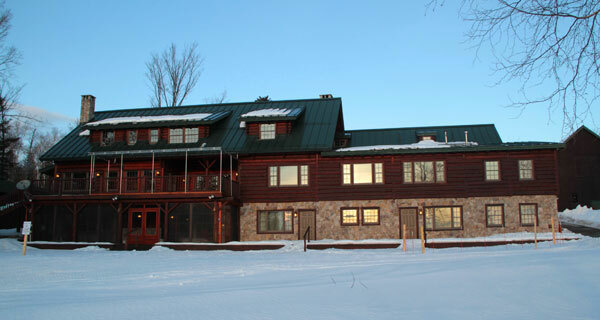 You will have snowy trails all to yourself at Saddleback, expansive lake views, and extra friendly people.